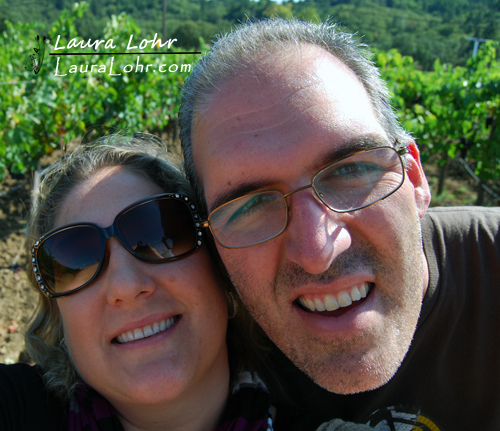 I posted about the anniversary and 40th birthday celebration we had in Sonoma on The Wine Road back on this post HERE. Today, I want to continue sharing our adventure on day two. We had such a great time and one blog post just wasn’t enough to cover all the fun we had! On day two, we woke up and had breakfast at the Hilton, where we stayed. After searching for the best online deals, we used the hotel shuttle to take us back to the airport to rent a car. 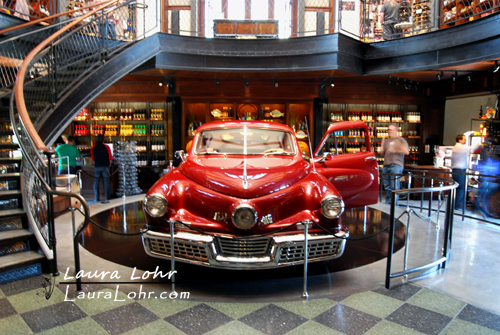 We picked up a Ford Focus and headed to our first winery of the day—The Francis Ford Coppola Winery in Geyserville. The winery was over-the-top awesome! The grounds are beautiful. 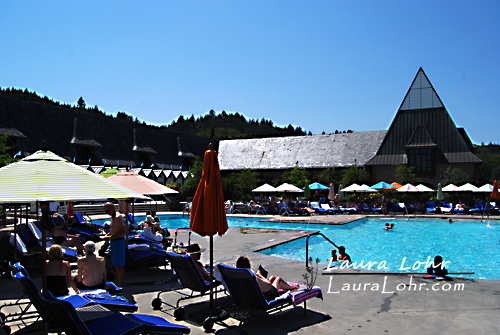 We felt like we had arrived on a Las Vegas casino property playing boom town bingo, with the beautiful grounds, the resort-style pool and all its grandeur. 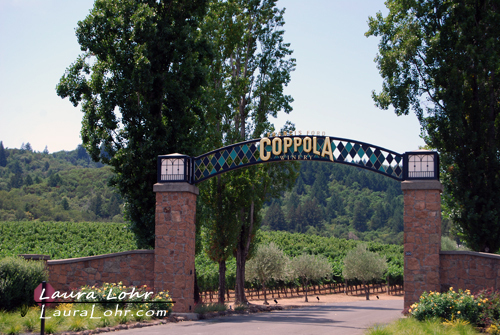 When we arrived at Francis Ford Coppola Winery, we went to the concierge to find out where we should go to redeem our three day pass to The Wine Road, which entitled us to complimentary tastings at over 80 different wineries. We were directed to the inside of the main building, where we found a friendly wine host that was more than happy to share the lovely wines that FFCW had to offer. We fell in love with several wines and had a lovely chat with our lovely host, who was a Southern California transplant to the area. 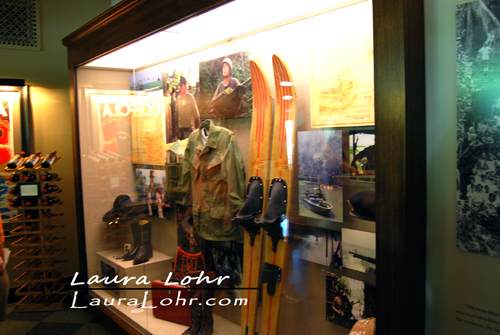 She was informative about the area, attractions we should not miss and we had a great conversation. This was one of the prettiest bottles! I loved the bottle and the wine! 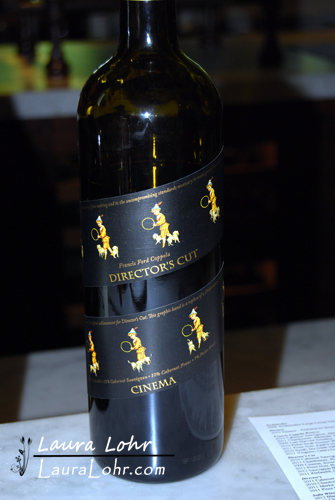 This was the bottle we settled on. 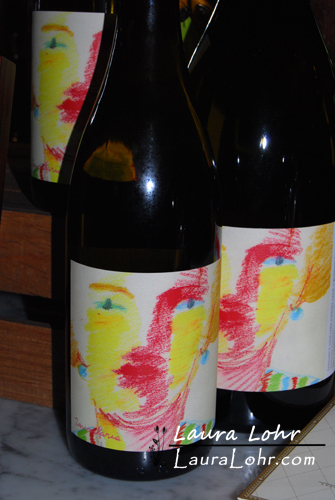 There were so many great wines, but this was the one we liked the taste of best. 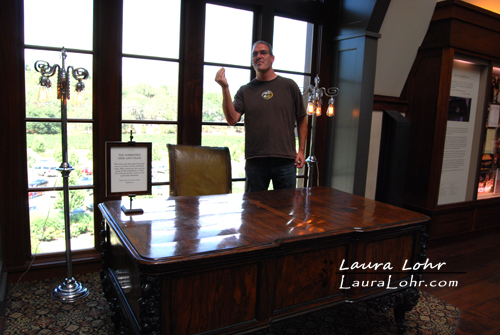 It was a great day and we were so impressed by the grandiosity of the winery. It’s definitely a “must-see” for anyone visiting Sonoma. 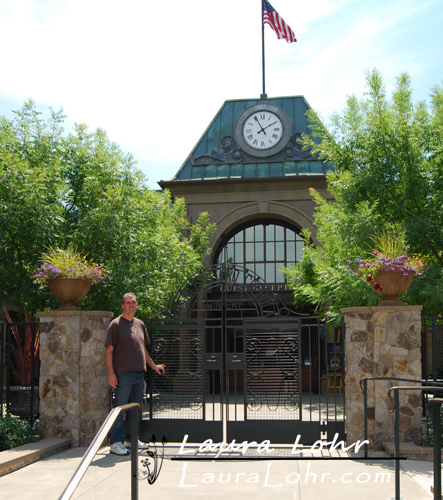 It was our first winery we visited in Sonoma and it left quite an impression. LOVED IT! I think we could have spent all day at Francis Ford Coppola, enjoying all they have to offer, nevertheless there was much more wine tasting ahead of us! 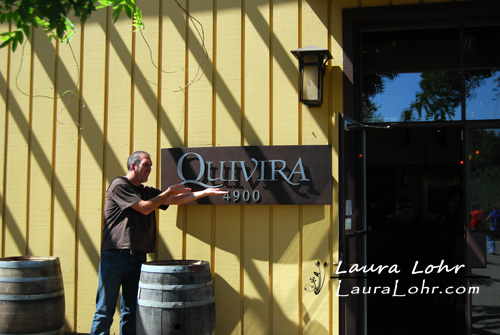 Next, we visited Quivira Vineyards and Winery in the Dry Creek River Valley of Healdsburg (Pronounced heels-berg. It would take 4 days for us to master the pronunciation!). 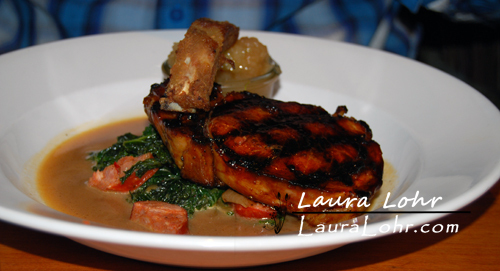 The location was recommended to us by Mr. Bear’s step-brother and it was a fabulous recommendation, indeed! We spent some time sampling the amazing wines and learned about the various varietals that Quivira has to offer. 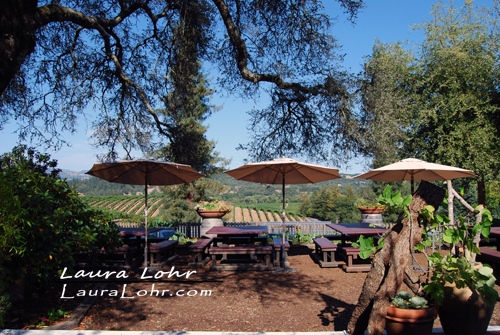 The Dry Creek River Valley is beautiful—as is all of Sonoma. The grapes were very close to harvest everywhere we went. 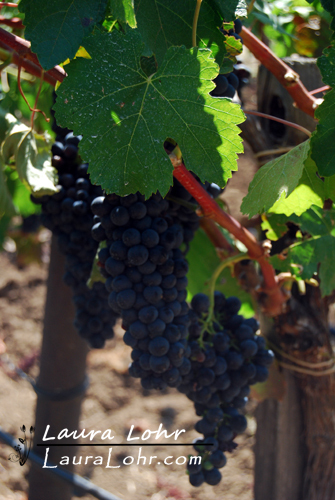 We would have loved to be there for the Sonoma Valley Crush Festival that is happening at the end of this month. Unfortunately, it was getting late, as the wineries usually close at 5:00 p.m. daily. We cut our visit much too short at Quivira to squeeze just one more wine tasting in. We found our way to the Raymond Burr Vineyards. It was equally beautiful, driving around the Dry Creek River Valley. 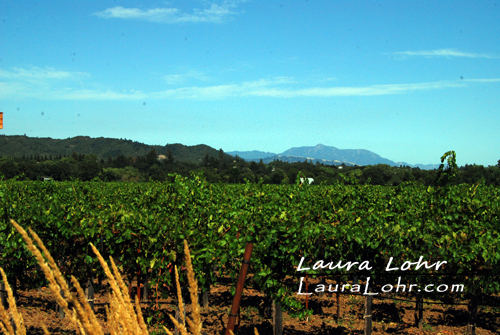 The vineyards were especially gorgeous, with the grapes so ripe on the vines. The weather was perfect! 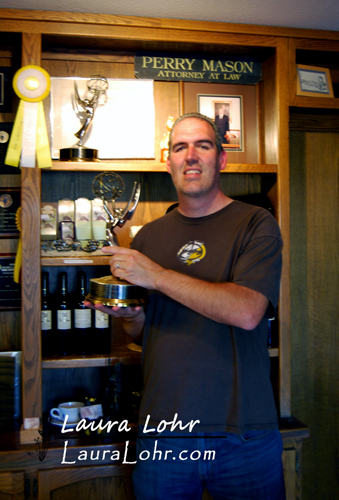 Mr. Bear, holding one of the many awards Mr. Burr won for his role as Perry Mason. It was extraordinarily heavy! Milk and cookies from the Hilton! …and lastly, we enjoyed a fantastic dinner at Monti’s Rotisserie and Bar, courtesy of The Wine Road. Mr. Bear ordered this delicious dish. 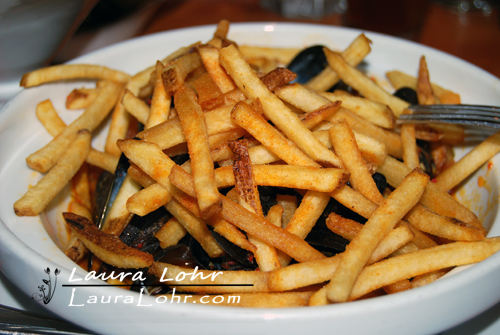 While I, on the other hand, opted for the mussels and fries. The food. Oh, the food! We finished the day with a dip in the pool and jacuzzi, then a nightcap (or two) at the hotel bar. It was a long, wonderful, amazing day. I couldn’t be more relaxed if I tried. Disclaimer: The Wine Road generously provided us with complimentary three day wine tasting passes and gift certificates to the Stark Restaurants, including Monti’s Rotisserie and Bar. Regardless, I was truly pleased with all the products and services we received and only recommend those that I can honestly recommend to my readers.